MTV and Swipe Telecom team up to launch Quad core 3G Calling Android Tablet for Indian market. The MTV Slate has 7.85-inch HD IPS Display with 1024×768 resolution, 1.2 GHz Quad Core Processor, 1 GB RAM, 3G, 5 MP rear camera and 0.3 MP front camera. MTV Slate runs on Android 4.2.2 Jelly Bean, the device has 8 GB inbuilt memory, 15 GB cloud storage and MicroSD card support up to 32 GB. The tablet is powered by 3200 mAh Battery which I guess not sufficient for the tablet. MTV Slate support call over 3G, it means you can use the tablet for calling facility. And it also has 5 MP rear camera and o. 3 MP front camera which ensures you don’t miss any video call. Swipe MTV Slate is priced at ₹ 14,999 with free cover worth ₹ 2500. The Tablet will be available in all retail stores as well as online stores. Swipe Telecom has launched one more tab i.e Swipe MTV Slate with amazing features. Isnt that cool! 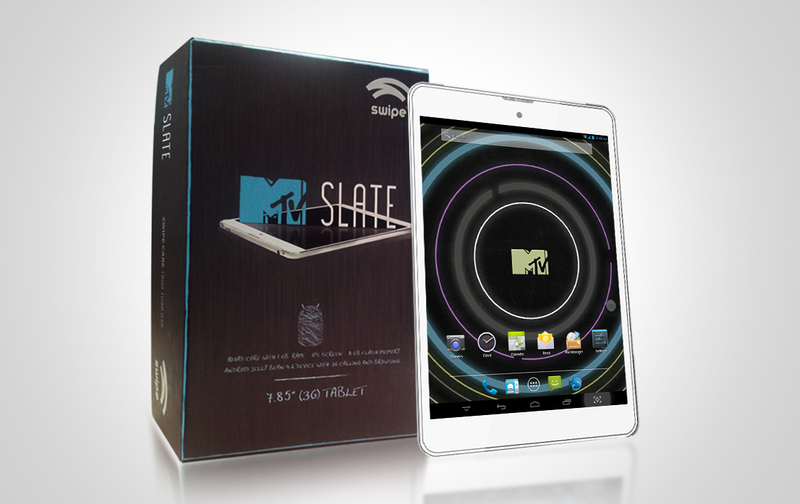 Swipe Telecom will undoubtedly rock the market with the New MTV Slate Tablet.